43-2500 Units: 1 set / 17 pcs. total This sugar crafting gun set includes a gun and 16 discs with various designs. Whether wanting a rolled fondant smooth "string" , "rope, "hair", and various other effects, it is a neat tool to use. Includes 16 discs and 1 gun. 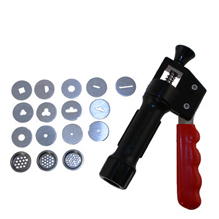 This sugar crafting gun set includes a gun and 16 discs with various designs. Whether wanting a rolled fondant smooth "string" , "rope, "hair", and various other effects, it is a neat tool to use. Includes 16 discs and 1 gun.